↑ 1.0 1.1 1.2 1.3 Brian Shields (2006). Main event – WWE in the raging 80s (4th ed.). Pocket Books. pp. 106–108. ISBN 978-1-4165-3257-6. 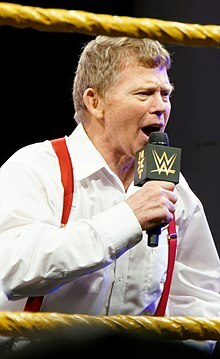 ↑ 2.0 2.1 2.2 "Bob Backlund Stats". สืบค้นเมื่อ 29 April 2018. ↑ 5.0 5.1 Royal Duncan & Gary Will (2006). Wrestling Title Histories (4th ed.). Archeus Communications. ISBN 0-9698161-5-4. ↑ "Bob Backlund announced as WWE Hall of Fame 2013 inductee". ↑ "Bob Backlund announced for 2016 Tragos/Thesz Hall of Fame". Pro Wrestling Torch. สืบค้นเมื่อ February 10, 2016. ↑ Pro Wrestling Illustrated (March 1979). "PWI 1978 Match of the Year Award". PWI 1978 Reader Awards. London Publishing Co.
↑ Pro Wrestling Illustrated (March 1983). "PWI 1982 Match of the Year Award". PWI 1982 Reader Awards. London Publishing Co.
↑ Pro Wrestling Illustrated (March 1995). "PWI 1994 Most hated Wrestler of the Year Award". PWI 1994 Reader Awards. London Publishing Co.
↑ Pro Wrestling Illustrated (March 1978). "PWI 1977 Inspirational Wrestler of the Year Award". PWI 1977 Reader Awards. London Publishing Co.
↑ Pro Wrestling Illustrated (March 1982). "PWI 1981 Inspirational Wrestler of the Year Award". PWI 1981 Reader Awards. London Publishing Co.
↑ Pro Wrestling Illustrated (March 1977). "PWI 1976 Rookie of the Year Award". PWI 1976 Reader Awards. London Publishing Co.
↑ Pro Wrestling Illustrated (March 1981). "PWI 1980 Wrestler of the Year Award". PWI 1980 Reader Awards. London Publishing Co.
↑ Pro Wrestling Illustrated (March 1983). "PWI 1982 Wrestler of the Year Award". PWI 1982 Reader Awards. London Publishing Co.
หน้านี้แก้ไขล่าสุดเมื่อวันที่ 20 กรกฎาคม 2561 เวลา 20:24 น.